CLICK this Image to see all of our Personalized 50th Anniversary Gifts for Couples – Party Supplies too. Personalized Traditional 50th wedding anniversary gifts for couples will be a keepsake they are sure to cherish forever. Personalize it or call Linda to help you. You can send your fiftieth anniversary gift directly to the anniversary couple’s home when you can’t celebrate with them. What is the traditional 50th Anniversary Symbol? Gold is the traditional Fiftieth Anniversary Symbol. Gold is also the Modern 50th Anniversary Symbol. Call Little Linda Pinda and I will create ANY YEAR anniversary gift for you with your choice of colors. We have a lovely array of beautiful 50th Wedding Anniversary Gifts for friends and family from very inexpensive to moderately priced. Most can be Personalized by typing in the couple’s names, wedding and or anniversary date(s). Type in Happy 5oth Anniversary message that has a special meaning to the couple. Lovely neutral golden tones will lend themselves in many decorating systems. I can change any of the colors or the years for another anniversary year. Call Linda to make any changes to my many designs. 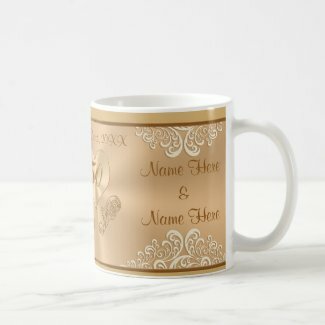 I can change colors, text font style, size, words and place any parts of any of my designs on any personalizable gifts by Zazzle. NOTE: Most of the custom 50th anniversary gifts for couples can personalized by you or CALL Linda and I will personalize it for you. Delete any text, change it or keep it. Click on the Anniversary Gifts to go directly to my Custom Zazzle Wedding Anniversary Gifts. Type in YOUR TEXT or Delete the text in the template text boxes to the right of the personalized anniversary gifts. I would love to make any changes to any gift with any of my original designs. You will be surprised at how affordable and high quality these personalized 50th anniversary gifts are. Soft and neutral tones for everyone’s decor. You can change the TEXT on both the Front and Back of this Custom Anniversary Pillow. Wonderful and memorable anniversary gifts for couples without spending a ton of money. I gave our friends a custom serving tray for their anniversary. They loved it and are displaying it in their dining room. Your friends will be thrilled that you found such a beautiful gift personalized just for them. Gold is the traditional 50th anniversary symbol, I designed golden anniversary gifts and neutral off white gives with touches of gold and some without. Excellent for many different rooms and colors. Bright vibrant and detailed print on demand so you can give a special 50th anniversary memory. CALL Linda for free design service on any of the many gifts from Zazzle. We will customize any of our designs to make it a very special and memorable Fiftieth anniversary gift ideas. Feel free to CALL Linda at: 239-949-9090. Little Linda Pinda Designs will customize it with no extra customization charges. Beautiful, affordable and memorable 50th Wedding Anniversary Gifts for Couples. The gold signifies their golden anniversary of 50 years. The soft off white designs will lend itself to most decor making both of these choices very popular among my best 50th anniversary gifts. If you sign up for Zazzle Black, for less than $10.00 a YEAR, you will also receive Free Standard Shipping on everything you buy at Zazzle for an entire year. Once you have Zazzle Black Free Shipping, you won’t want to give it up. Each year they send me a reminder that it is coming due and I renew it every year. It gives me the freedom to send an inexpensive or heavy or more expensive gifts all over the country for free. I absolutely love Zazzle Black. by Clicking the following image. Fiftieth Wedding Anniversary Gifts for Couples. Friends and Family will love how you personalized it. See lots more Personalizable Gifts for many Occasions, Sports, Photo Gifts and more. Please Visit us by Clicking on the Baby Tiger. If you have been looking for a unique 50th anniversary gifts but haven’t found the right gift, please feel free to give me, Little Linda Pinda a call. I am happy to make changes to any of my designs. I can also help you customize it, as I am the original designer of these personalized 50th anniversary gifts. Vintage looking antique paper with golden swirls and “Happy 50th Anniversary”. This fiftieth anniversary present, you don’t need to personalize. If you wish to, please give Little Linda Pinda a Call and I will make anniversary design changes, add text templates to fit your text or other changes. We will make changes to any of our designs to any colors and any year anniversary too, with or without names, dates etc. I can change the colors, designs and text. I can also add the couple’s anniversary date and names for you too. Wait until you see their faces when they open up your personalized 50th anniversary gift. 239-949-9090 CALLING is the Best and fastest method to contact me. [email protected] (Subject Line CONTACT). Calling is BEST. I hope you enjoyed looking at just a few of our gifts for fiftieth anniversary. We have so many more 50th Wedding Anniversary Gifts for Couples. Give to your dear friends and family for a day they will cherish forever. Thank you for visiting my featured Personalized 50th Wedding Anniversary Gifts for your very special friends. 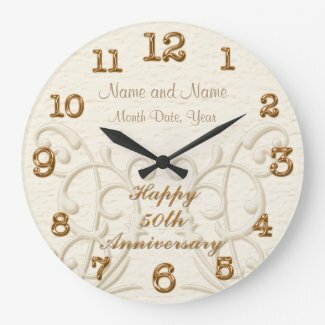 I’ve created cheap 50th anniversary presents, under $20.00 and moderately priced with most anniversary gifts under $50.00 with a few under $100.00. 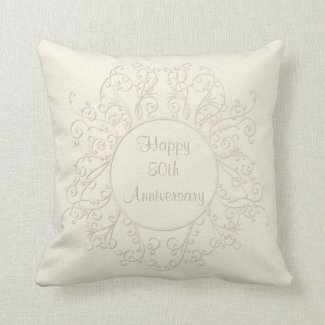 Personalised 50th anniversary gifts color and occasion, year, design elements can all be changed by Little Linda Pinda. If you would like any part of my anniversary designs placed on a different ZAZZLE, product, please give me a call. I can make it for any year anniversary in any color. [email protected] CALLING and TEXTING is fastest and best.